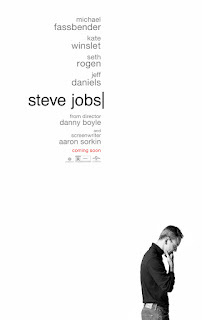 There is a scene roughly midway through Danny Boyle's Steve Jobs that is so electric, so quickly paced and ridiculously intense, that you'd struggle to believe this is simply the story of the man who gave us iPhones. But director Danny Boyle and screenwriter Aaron Sorkin, along with Michael Fassbender himself, elevate what is already a powerfully mesmerising story into something packed with energy and excitement. The film would be forgiven if it took its time, slowing the pace right down and letting this story unfold slowly, but it does the complete opposite. Steve Jobs follows the conventional three act structure, but in an unusual way; each act plays out almost in real time, telling the story of the moments immediately before Jobs launches a new product. We begin in 1984, then jump to 1988 before closing with 1998. The film therefore spans 14 years in just two hours, but it does so seamlessly, and with one hell of an emotional punch at the end. Danny Boyle has, once again, taken an already compelling true story, and turned it into a cinematic masterpiece. The film's three act structure, whilst also making it perfect material for a potential theatre production in a few years time, works best in respect to Jobs' daughter, Lisa. We initially see her at just five years old, then with one cut she becomes nine, and an hour later she is nineteen. Yet despite only seeing three days of her life, she feels fully fleshed out as a character, as if we have seen her entire childhood lived out before us. Whilst the film, naturally, focuses more on Jobs himself than his daughter, this emotional family based arc is what gives the film its sense of humanity. In the early sequences, Jobs is almost negligent towards his daughter, and it's genuinely upsetting to watch. Yet as the film goes on, and as we jump through the three specific years, we see how their relationship has changed and are made to fill in the gaps by our self. But this works in the films favour, rather than dump exposition onto us or force into a series of flashbacks, we can pick up their current state from small pieces of dialogue and their body language around each other. It's a testament, really, to just how good the performances in this film are. And that doesn't stop with just Fassbender and the three Lisa's, either. Kate Winslet is sensational as Joanna Hoffman, Jobs' confidant, adding the perfect amount of delicacy to her otherwise strong, empowering character. Winslet herself met with Hoffman before production began, and learned first hand what her feelings and thoughts towards Jobs were, and she portrays them seamlessly. Even when they argue, her respect and admiration for him remains a subtle underscore throughout. It's what makes her ultimate near-breakdown in the film's final stretch so heart-wrenchingly gutting; she never cracks throughout the film, right up until the moment that she does. Seth Rogen also shines, giving arguably the performance of his career. Seriously, who knew this guy could act like that? He spends a vast amount of screen time arguing with Jobs, but completely sells it. Michael Fassbender acting against Seth Rogen doesn't sound like a fair fight, but Rogen admirably steps up to the challenge and absolutely nails it. Of course, though, the film belongs to Fassbender. He portrays Jobs' every personality trait with ease, sometimes offering upwards of five different emotions across the space of just a few minutes. If he just gets one Oscar nomination this year, I'd give it to him for this over Macbeth (despite how fantastic he was then, too). Steve Jobs isn't just an acting success, though. Danny Boyle has crafted this film with a relentless dosage of electric, kinetic energy that allows it to soar through its first two acts at a breathless pace. Despite the fact that this film essentially consists of two hours of dialogue ("We had a 180 page script, and somehow cut it down to a 200 page script" said Danny Boyle in a pre-screening introduction I was lucky enough to have attended), it never feels like an overload. Boyle's quick pace compliments Sorkin's dialogue heavy script, and the two combine to form quite an accomplishment. Steve Jobs makes use of rapidly cut montages to break up its clearly defined three acts, and each one is so wonderfully edited that they simply ooze enjoyment. This could have been a very serious film, about interesting subject matter that took things slowly, but Sorkin's script injects some fantastic humour along the way, even in some of the film's most intense sequences. Even with this rapid pace, though, the film never forgets the little details. A subtle mention to the iPod in the film's final act is somehow quite a touching moment, and there are nice, warming little conversations between Jobs and Lisa that feel so unabashedly real. These small touches, combined with the relentless energy and just bravura film-making in generally really, are what makes Steve Jobs stand out from the endless pack of biopics we're subjected to every year. To Summarise: Extremely well paced and bolstered by stellar performances from Michael Fassbender and Kate Winslet, Steve Jobs is both an outstanding biopic in itself and another masterful addition to Danny Boyle's increasingly impressive resume.